BDS Suspension introduces new 1" and 2" leveling kits for the redesigned 2017 Ford F250 and F350 Super Duty 4wd trucks. Designed to improve the stance of your truck, these kits allow for up to 35" tires to be installed. Kits will fit both gas and diesel equipped trucks and include bolt in lower coil mount spacers, ball joint alignment cams (2" kit only), a track bar drop bracket (2" kit only) and your choice of new shocks at each corner for improved performance. As with all BDS lift kits, these kits are backed by Factory Protection Plus for peace of mind wherever your adventures may take you. Factory Protection Plus includes BDS’s exclusive No Fine Print Warranty along with a 5-year, 60,000-mile drivetrain warranty. These are the first of many new kits coming available for the new 2017 Ford Super Duty. BDS is now offering 2 new leveling kit options allowing you to give your new Super Duty a subtle lift and leveled stance with room for up to 35" tires to be installed. Kits are available in 1" and 2" lift heights so you can dial in the stance of your truck. 1" Leveling Kits: This kit includes a pair of bolt-in lower 1" coil spacers built from 6061-aluminum. 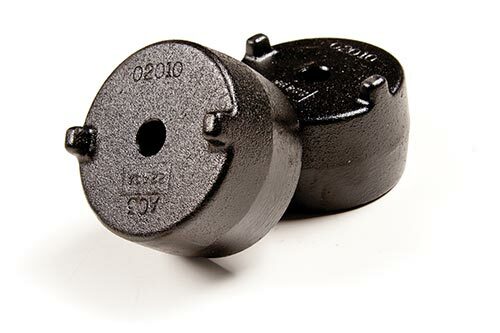 This offers a better appearance in the wheel well that top mounted coil spacers with the coil spring visible rather than the spacers. Also included are your choice of NX2 gas shocks or FOX 2.0 performance shocks for improved performance for all 4 corners. This kit allows for up to 34" tires to be installed. 2" Leveling Kits: Building on the 1" kits, the 2" leveling kits for the 2017 Super Duty include a pair of 2" lower coil spacers built from 6061-aluminum with a durable black e-coat finish. These bolt into place and combine with a pair of ball joint alignment cams for correct axle positioning. The lower spacer design cleans up the wheel well appearance with the full coil visible rather than a top spacer with other leveling kits. To correct the front axle positioning a heavy duty replacement track bar drop bracket is supplied to bolt in place of the factory track bar frame mount. This bracket is built from 1/4" steel, full welded and finished in a durable textured black powdercoat. 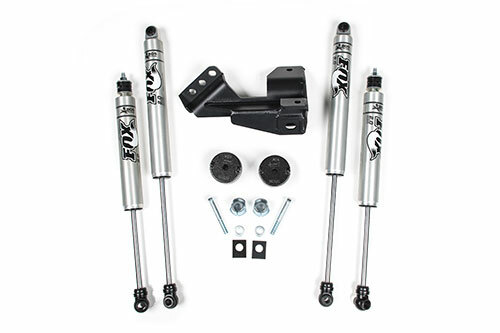 To improve help improve the overall ride quality and dampening performance this kit includes your choice the BDS NX2 series gas shocks or specially tuned FOX 2.0 performance shocks for the front and rear of the new Super Duty. This kit allows for up to 35" tires to be installed. Hey Charles, the black F250 in this new product announcement is running the 2″ Leveling Kit on 34×11.50 tires on stock 18″ wheels. By law a lift kit will not void the warranty (Magnuson Moss Warranty Act), many dealerships have brand new lifted trucks on their lot for sale. All BDS lift kits come with Factory Protection Plus, an premium warranty program that includes BDS’s no fine print warranty on BDS parts and a 5-year, 60,000-mile drivetrain warranty to match the OE warranty in the event the dealer tries to deny a warranty claim faulting the suspension mods. For more on the topic contact our sales/customer service team at (517) 279-2135. Was there any rubbing on that black 250 setup? the 2″ leveling with 35×12.50 tires on 9″ wide wheels works well on the 2017 Super Duty. We didn’t have any rubbing on this truck. Hi Carter, I have a 2017 F250 – XLT with stock 18″ wheels, they’re 8″ wide (not 9″ as you state here). The local tire store says they can get 35×12.5 tires on the stock 18″ (8″ wide) wheels, but if you’re running on 9″ and I try to pinch them on 8″, they may bow (at least changing the profile of the tire) and result in rubbing you didn’t experience. Did your setup actually have 9″ wide wheels, or was that a typo? Thanks regardless. Hi Chris, admittedly I don’t recall the exact specs of the stock wheels used on our test truck, In searching online for factory wheel specs I show Ford offering 18s in a 18×7.5 Wheel (+34mm offset/5.6″ BS), 18×7.5 Wheel (+44mm offset/6″ BS) and 18×9 (+44mm offset/6.7″ BS) on the late model Super Duty. While any of those wheels are acceptable to use for 35×12.50 tires, they will all have minor differences on fitment and there is always the potential for rubbing, Actual tire size and aggressiveness of the sidewall can also effect clearance. Our recommended specs are designed as general guidelines. When is the 4″ – 4 link with coil overs coming out for the 17 f250? I just bought one and it needs lifted now! 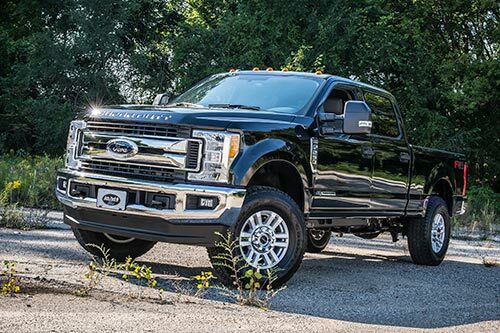 Hey Shad, we have additional lift sizes and options in the works for the 2017 Ford Super Duty. Currently we’re offering up to the 4″ radius arm systems. 4-link and coilovers haven’t hit the shelves yet. As kits come available we’ll be adding them to our website, sending out announcements and promoting on social media. Unfortunately I can’t get into kit specifics, price point or expected release dates due to company policy. Stay tuned for more as kits hit the market. I have a 2017 F350 Platinum 4×4 and I would like to know which lift would be required to fit 20X12″ wheels with 35×12.50 tires. Thanks for your advice. Will 2″ Level Kit work for 35 x 12.5 x 20 tires and 10″ wheels? what would the offset be? I know the 9″ should work but would like deeper look. while that wheel/tire combo will likely clear for everyday on-road use, its outside of our recommended specs for that kit so we can’t guarantee it won’t rub and require some trimming at full turn, especially in offroad situations. To minimize the potential for rubbing a wheel with 4.75-5.25″ backspacing (-19mm to -6mm offset) should be used. I’ve purchased a 2017 F250 crew 4×4 that comes with LT275/65Rx20E OWL A/T tires which are 34.1 inches tall and 10.8 inches wide on the stock 20′ wheels as it comes from the factory. I just want to up it a notch to 35×12.5(or 11.5 not sure yet)x20’s back onto the stock wheels. I’m really only looking for a level look on the body with your kit so would a 1″kit suffice or do I need to go 2″ to achieve it? If you’re sticking with the factory wheels you will likely be able to fit them with 1″ spacers. If you’re running them with aftermarket wheels the 2″ will offer a bit more clearance. To get teh level stance you’ll want to measure the front vs back stance to see how much you need as the trucks varied from the factory. while we haven’t tested that particular wheel/tire combination, I would think you’ll like need our 4″ lift to fit that setup. You may be able to run a smaller 2″ leveling kit, but typically you’re limited to about a 35″ tire with a 2″ leveling kit. The 4″ kit is typically used to fit 35-37″ tires. Is it also recommended with the 2 inch level, a track bar drop bracket? Hey Gary, we are in the process of revamping the 2″ leveling kit listings to include a small track bar relocation bracket. Once kits are available we’ll be relisting them on our website with the updated information. I just purchased a 2017 F350 4×4 and want to fit 35″x12.5″x20” wheels and tires. I’ve seen above that a 2″ lift should not rub in most situations depending on the off-set. My question is should I just add the blocks or should I also install your FOX shocks all around to make up for the loss in travel? Thank you. You can add a taller rear block if you’d like, but its not required to fit the 35″ tires. The F350s can from the factory with a larger block than the F250s so you’re likely around 2.5-3″ nose low currently. We’re revamping out 2″ leveling kit to include a track bar relocation bracket as well as have several new lift options coming available very soon. The factory shocks will limit your droop travel slightly, which they were designed to be the limiting factor. The main improvement with the FOX 2.0 shocks upgrade is better handling and ride quality across all terrains. Is the 1″ leveling kit sufficient to clear 295/60r20(34.25×11.5″) tires with a -12mm offset wheel? Hey Alejandro, its difficult to answer that question without knowing the width of your wheels. -12mm offset is relative to the width of the 20″ wheel you are asking about. That said you may be able to fit them with little to no trimming, however the 2″ would be the safer way to go for sufficient clearance. Carter – Can you tell me what part number that I need for a 17 ford f350 drw, 4×4, diesel (stock height) ? I see the rear part number on the website. Hey Tom, which product are you asking about the part number for. These kits fit all F250-F350-Dually trucks. We have the kit numbers listed above along with links to more info on our website. 2017 f250 With 2 inch lift and your drop track bracket is this all that’s needed to keep steering like factory or should I get something more? At 2″ of lift we offer a complete system that includes the coil spacers, track bar relocation bracket, ball joint cams and longer replacement shocks. Recently purchased 2017 F-250 Diesel King Ranch and thinking about a leveling kit. The local ford dealership is quoting $650 which includes install. Would you recommend a 1″ or 2″ leveling kit? And will BF GOODRICH ALL TERRAIN Baja Champion LT315 70R17 fit? These are the tires that come on the 2017 Ford Raptor. Or what tire would you recommend for someone who drives a lot on the highway and not pulling anything as of yet? you’ll want to go with the 2″ leveling kit to comfortably fit the 315/70r17 (35×12.50) tires. The final price will depend on your shop’s install rate, you can always check with your local BDS dealer to see what they quote you for the parts and install. http://bds-suspension.com/distributor-lookup. As far as tires go, BFG builds high quality tires, their All Terrain KO2 is a great tire for on-road and mild off-road use. They’ll give you a long tread life and a quiet ride. Hey Gregory, we do have some additional kits (and sizes) in the works for the late model Super Duty, a few of which will be in the 2-3″ height range. That said I can’t get into the kit details, price point, or expected release date due to our company policy. Once kits are on the shelf ready for sale we’ll be adding them to our website, sending out announcements and promoting on social media so keep an eye out for new products in the future. I plan on getting my new 2017 F-250, crew cab diesel this fall. The pics of the black ford look awesome! I also plan on getting a 5th wheel camper. With the 2″ leveling kit on 35″ tires, will it be too high for a 5th wheel hitch and camper? I currently have a 2007 Dodge Ram 3500 mega cab, with 6″ suspension on 37″ Nittos. I cannot use a 5th wheel camper due to the truck too tall. Instead of a ford, I also am considering a 2017 Chevy 2500 crew cab diesel. Same question about leveling kit. With a leveling kit, the rear is not lifted at all, just the front to level out the stance. The only additional height will come from the larger tires which will raise the overall height slightly (about 1″ higher when going from 33″ to 35″ tires). This shouldn’t cause any issues with towing your 5th wheel, but ultimately the topic of towing with your truck will be dependent on your particular trailer and what height you are able to hook up and tow safely. Want to keep factory springs but want to run 35’s (37’s would be ideal but don’t want to replace springs). What do you offer for my F-350 and what size tires can I run? What backspacing/offset do I need to run? Do you offer Fox remote reservoir shocks with this? Hey Dan, thanks for your interest in BDS. 35s will fit on the 2017 F350 with the 2″ leveling kit and allow you to run the factory coil springs. With that kit our recommendation is for 35×12.50 tires on anywhere between stock wheels and 9″ wide wheels (4.5″ BSing). We’ve heard of customers squeezing 37×12.50s on stock wheels with just the leveling kit, but trimming would be needed. For proper fitment of 37s we recommend the 4″ lift kit, which uses our replacement full length ProRide coil springs. As far as the shocks we don’t offer the FOX 2.0 remote reservoir shocks with our kits at this time, but if ordering the kit through your local BDS distributor they have the ability to substitute the standard shocks for FOX remote resi, http://bds-suspension.com/distributor-lookup. Check with them for pricing. Hi Carter, thanks for your prompt response; it’s good to hear from you. 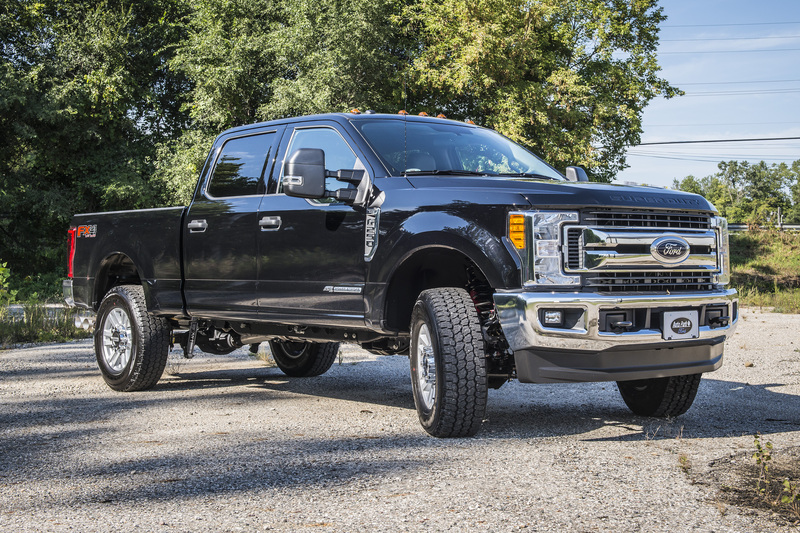 The F-350 provides greater towing and hauling capacity (than the F-250) and when I opt for the FX4 package, it upgrades the factory front springs. I really don’t want to diminish the capacities or throw out factory springs just to run 37’s so I appreciate you helping me keep the stock springs while find a way to run 37 x 12.50 (or 13.50″) tires. 1. What trimming will be required to run 37 x 12.50 tires? Are we talking plastic trimming only (which is fine) or something else? 2. I definitely want to replace the stock shocks when I put on the 37 x 12.50″ tires. 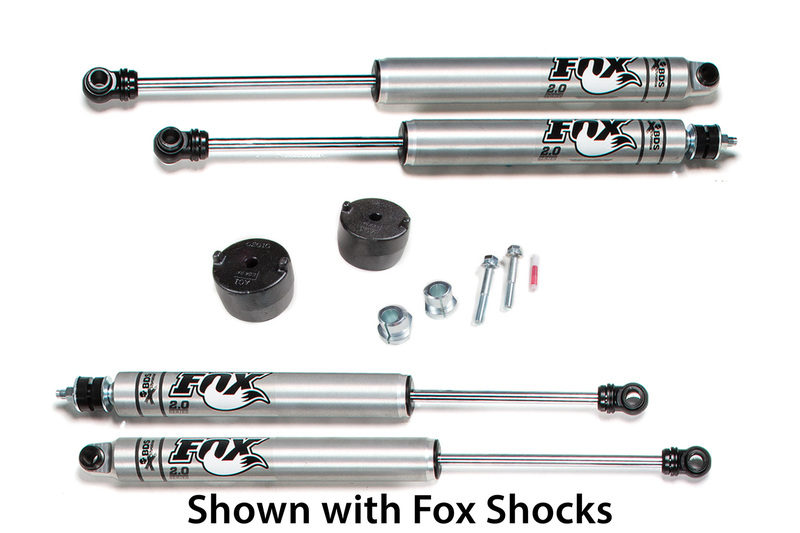 Will the Fox 2.0 shocks work with the 2″ level kit and 37″ tires to replace the stock shocks? Does the 2″ Leveling Kit come with Fox 2.0 shocks? I noticed a flyer on the kit (it’s a PDF on your website) says they’re NX shocks. And there’s no mention of Fox 2.0 shocks on the 2″ Leveling Kit web page. The 4″ suspension lift with Radius Arms does mention Fox 2.0 shocks. Can I get 2.0 shocks with the 2″ Leveling Kit? I had a BDS 2in leveling kit put on a 2017 F-250. A couple days later I put 35’s and some new 20×10 wheels. After doing this the steering was really loose and not near as responsive, almost like it’s bump steering. Anything I can do to tighten this up or bring it back to near factory steering. I wouldn’t have thought it would have changed much if any with such a small change in height. Other trucks I had leveled in the past with various kits never had this problem. Any insight is greatly appreciated. Hey Aaron, there are a couple possibilities that come to mind. Being you didn’t have an issue before the larger tires/wheels installed I’m curious if the tires are balanced properly or if the front end was re-aligned since the leveling kit was installed? Also was our entire kit installed (coil spacers, track bar bracket, ball joint cams, and shocks)? If your truck has the adaptive steering system that cause cause drivability issues. Another option is upgrading the factory steering stabilizer to compensate for the larger wheels/tires. Our customer service/tech support team is available to help you look into the topic further and get it resolved. They can be reached at (517) 278-7144 or by email at (tech-bds@sporttruckusainc.com). Thanks for the reply. I do not have the adaptive steering on this vehicle. All components have been installed. I’ll start with the alignment, it was “supposed” to be done. I will verify and go from there. Thanks again. Carter, I sent out an email to the above address a few days back and haven’t heard anything. Can you have them reach out to me please? If I install your 2″ kit, will I have any problems running 22×12, 44m back set rims with 35×12.50R22 tires? Hey Danny, that wheel is outside our recommended specs for the 2″ kits so I can’t guarantee fitment. Typically customers run our 4″ lift kit if running 35×12.50 tires on 20×12 wheels, even then there is the possibility of some trimming being needed to eliminate rubbing in all driving situations (on and off-road). Hi is the kit will fit a f 450 ? Officially we haven’t released these kits for use on the 2017 F450, that said we have had several customers install them on the F450 without issue. Hi, just purchased a 2017 F350 SD 6.2L gas and will be adding a Boss EXT plow. We will also be adding Timbren kit to prevent the truck from sagging when the plow is installed. Are we still able to add the 2” leveling kit? Along with the Timbren kit? Does the leveling kit affect front axle ratings at all? Please advise…. At this point we haven’t tested our leveling kits in combination with the Timbren bump stops to confirm compatibility, but from looking at the Timbren’s website and install instructions their front SES bump stop spacers appear to install in place of the factory bump stops whereas our 2″ leveling kit uses bolt-in lower coil spacers, replacement shocks, replacement track bar bracket and ball joint cams so there shouldn’t be any interference issues. According to Timbren instructions their kit is in contact with the frame/axle at normal ride height once installed, so the extra 2″ of ride height achieved by our leveling kit will likely cause the Timbren parts to not be engaged at ride height while unloaded. The factory coil springs would likely need to be compressed to engage the Timbren bump stops. Our leveling kit does not effect that axle ratings and unlike other leveling kits on the market it is designed to correct the caster and front axle positioning for proper function with room for larger tires. For more on the topic contact our customer service team at (517) 279-2135. Hello, with the 2″ kit and 35″ tires, do you know the new total/overall height a F-250 would be sitting? I am trying to determine if it would fit into the garage. Overall height isn’t a measurement we take when setting up the trucks as there are a number of factors that will effect the number including actual tire size, whether the truck has cab lights and heavy accessories like winch bumpers and bed caps. You can estimate the height by measuring your height stock, then adding 2″ for the lift height and adding 1/2 the difference in tire size (i.e. going from a 33″ tall tire to a 35″ tall tire will raise the overall ride height by 1″). That will give you a rough estimate on the height. I was considering the 2″ leveling kit on my 2017 F-250, but now am leaning toward the 1″ kit just to take some of the rake out. Being a perfectionist, I want my alignment and axle position to be perfect. Most shops look at me like I’m crazy when I tell them that I’m considering the track bar bracket for the 1″ kit, as most install as much as 2.5″ spacer kits with no bracket. (They obviously aren’t perfectionists). What is your opinion? Do I order alignment cams as well to insure perfection? I will have the shocks replaced with Fox units at this time as well. Thanks. We include the track bar bracket and ball joint alignment cams with the 2″ level kit to reposition the front axle and keep the coils from contacting the frame rail. The 1″ doesn’t require the track bar bracket, however it is available as an option. Our track bar bracket is designed for 1-3″ of lift and doesn’t lower the mounting point (which could potentially cause bump steer), instead it uses a slotted track bar mount with a cam lock washer to correct positioning between 1-3″ of lift. For more on the track bar bracket head to http://bds-suspension.com/blog/?p=14528. The ball joint alignment cams will allow you to dial in the alignment for optimal handling and tire wear. With this 2in kit does anything else need to be replaced? Track bar drop, sway bar drop, caster get into spec after alignment without new arms? Hey Jared, check out the 2″ kit description where it outlines all the components. The 2″ leveling kits include lower bolt-in coil spacers to provide the lift, a track bar bracket to recenter the front axle, ball joint cams to correct caster, and new shocks all the way around. Our track bar bracket doesn’t lower the mount, instead it shifts the track bar mounting point over to recenter the axle while keeping the track bar in phase with the drag link to optimal handling. We build this as a complete kit with everything needed to properly level your Super Duty, designed to be used with the factory radius arms. Sway bar relocation is not necessary at 2″, we don’t offer it until 4″ of lift and above. We do offer heavy duty radius arms to correct the caster with 2-4″ of lift as well, which can be purchased separately. So after the 2″ leveling kit install on my 2017 6.2 F-250 it feels like i’m driving a truck with 300K miles on it. Steering is very loose and the bump steer is bad as well. I have a dual steering stabilizer on it, radius arm drop brackets and the caster has been slowly brought up to around the 6 to 7 degrees over the course of about 5 or 6 realignments in hopes of correcting this issue. The response in the steering has gotten better but still not what it should be and nothing has corrected the bump steer. What else can i look at to help fix this issue. I did also recently replace the stock steering dampner for a King shock but the steering wheel wouldn’t return to center with the dual steering stabilizer on as well. Also I can’t get a dealer to reset or recalibrate the steering angel sensor or adaptive steering due to the leveling kit. Tired 4 local dealers who won’t touch it due to liability issues. Any help would be greatly appreciated. Yup BDS kit and it was installed with the caster shims included in the kit by the Ford dealership that special ordered my truck. Issues were worse with just the kit installed according to supplied instructions. Then a set of drop brackets were installed to gain more caster as the shims only go so high. I’ll try them again, hopefully more information is available now that the trucks have been out for a little bit. Thanks for your response. I have the exact same issue, not sure what to do, my caster angle is at 3.5, and the steering is super sloppy in my 2017 f350 platinum with the BDS 2″ inch level. What is the angle of the ball joint cam included in this kit, is it 2.0 degrees? I am looking at the 2″ leveling kit for a 2017 F-350 but I am wondering if the kit you sell needs to have the shocks replaced with the kit, or can you keep the OEM shocks? I am asking because I had the Fox shocks in my Duramax and I went through two complete sets in 3 years…absolute crap product and wouldn’t recommend them to anyone North of your border. I was told the Fox shocks only have a 1 year warranty; what warranty do the BDS shocks carry? I ended up going with Billstein shocks in the Duramax and they carry a lifetime warranty, at half the cost of the Fox. Hi Carter, I’m having trouble finding the kit without the shocks (part #013202) on this site or in google search. Is this the correct part #? If so, can you post a link to where to buy this kit? Thanks! I want have a 2018 F350 dually. What tires can I run with your 1″ kit and my stock wheels? Thanks for your time! We list our recommended tire size above, with the 1″ coil spacers you aren’t gaining a ton of clearance so typically one tire size larger than stock which will fit on your factory wheels. Are the NX2 shocks any improvement over the stock Ranchos? Also, how do the NX2s compare to the Fox 2.0s? Most of my driving is pavement, the only off-roading are trails at my hunting lease. Thanks! the NX2s are designed to be a stock upgrade to offer improved dampening performance. The NX2 is a gas charged twin tube shock that offers 10-stage variable valving to improve performance on a range of terrains. The NX2s are our upgraded (now standard) shock for most kits, the FOX 2.0s are still our premium shock option and use a high-pressure gas charged monotube shock design with internal floating piston. Either shock will be a great option for your truck for on-road and some off-road use. I would like to add 35 inch tires on stock 20 inch rims on my 2018 F350 equipped with adaptive steering. I’m looking at the Toyo open country at II 295/65R20. These are 11.8 inches wide. Will these narrow 35’s on stock rims be ok with your 1 inch lift? And will this setup likely cause me problems with the adaptive steering? Hi Dominic, while we spec 34″ tires on the 1″ kit and 35″ tires on the 2″ kit, we have had customers fit 35s will just the 1″, you shouldn’t have any issues fitting 295/65r20 tires on their with the stock wheels. Our kits are compatible with the adaptive steering so you won’t have any issues their either. Good news. I just went to the order page and found that now I have to decide what type of shocks to purchase, nx2 or fox 2.0. Since the truck will never be off road, which shocks will give a less harsh ride on the freeway? Hi Dominic, while shocks aren’t required when lifting your Super Duty 1″, we do recommend them to improve dampening performance. Either of our shock lines (NX2 or FOX 2.0) are a great option for on and off-road use, the benefits of the FOX 2.0 are lighter weight, better shock internals, and faster valving. For a vehicle use primarily on the road the NX2 twin tube shock will work well for you and same some money over the price of the FOX 2.0 monotube shock. If you decide to purchase just the coil spacers you’ll need to order #013101 box kit. I bought the 1 inch kit. I installed the 35 tires and they fit without the kit with no rubbing. I want to first thank you for replying to all these comments. I appreciate good customer service and I’m sure everyone thinking of buying BDS agrees. My question is if just keeping the stock 275/65/20 Michelin LTX A/T 2 on the truck and looking for a level stance on my 2018 F250 Platinum, which kit should I go with? I understand both the 1″ or 2″ kits will work but why choose one over the other? Stock wheels/tires can be reinstalled and not look out of place. Ultimately you’ll want to take measurements as not all trucks have the same front-to-back stance from the factory. Measure from the center of the hub up to the top of the opening of the wheelwell both in front and back to figure out how “tail high” the stance is currently. From there order the 1″ or 2″ spacer to achieve the level stance. I recently bought the 2” level kit with the upgraded fox 2.0 shocks through stage 3 Motorsports. I have a 2017 Ford F-250 superduty, diesel, crew cab, fx4 with 4800 miles on it. My local very experienced tires shop that does allot of lifts and levels did the install and put Nitto ridge grapplers 35×12.50×20 tires on at the same time. This has to be something simple, I have had terrible luck buying everything from this to a toaster lately, BDS has a awesome reputation which is why I felt good spending my money on them, hope someone can give me some insight I can share with the installer. Hey Scott, I’m sorry to hear your having issues with your truck and we’d be happy to help you diagnose the issue and work with Stage 3 Motorsports to get to the bottom of what’s going on. Its possible something isn’t installed correctly or there is an issue with a part. We outline the install and torque specs in the instructions at http://bds-suspension.com/instructions/013202.pdf. Its difficult to diagnose over the phone or internet without having the access to the vehicle. Along with that I’m personally not the best to offer assistance being over on the marketing side. Our tech support team is better equipped to offer assistance and can be reached at (517) 279-2135 or tech-bds@ridefox.com. Hello, I have a 2017 F350 King Ranch with the 8′ bed. The stock tires are 275 65 20. I am wanting to go up a size to 295 65 20 and keep the stock wheels. Do I need the 1 inch or 2 inch leveling kit? Do I need anything other than the coil spacers and the shocks in the kit? I have 38′ 5th wheel that I pull at least once a month. Thanks for you input. Hey John, thanks for the interest and for reaching out for more info. Most 295/65r20 tires will measure out to right around a 35″ x 11.75″. While you may be able to fit them on just the 1″ kit with little to no trimming, the 2″ kit is recommended for sufficient clearance in all driving situations (on and offroad use). We list all the components that come in each of the kit in the product announcement above. At 1″ you can get by with just the coil spacers, the factory shocks can be reused if you choose to. Our NX2 and FOX 2.0 upgrade options will offer improved performance. When going to 2″ and above more components are necessary to correct suspension geometry. The axle begins to offset towards the driver’s side requiring track bar correction to recenter the axle. The caster also changes due to the lift so we include ball joint cams to correct the caster for alignment. Lastly are new (longer) shocks designed to improve performance and ride quality. Hey guys, I recently purchased a 2″ leveling kit for my 2017 F250 Platinum. I’ve been to 2 shops because after the kit was installed, my truck pulls to the right. Both shops said my alignment was good but the last shop noticed my caster was .5 off from my driver side. Do you have other cams to offset this issue? Other then that, love the way the truck feels and drives with these new shocks. Hi John, you sure can, stock wheels will bolt right back on with the kit installed. Where you may run into an issue is installing anything wider than a 35×12.50 tires. The factory wheels has a larger backspacing measurement of 5.7-6.25″, we recommend 4.5″ backspacing for optimal tire clearance to the suspension and body. the Super Duty trucks equipped with snowplow package do use a different (heavier rate) coil springs in the front, but just the same our 1” and 2” leveling kits are compatible. On the 1” vs 2” topic we recommend taking a measurement of front fender height vs rear fender height to make the decision based on the final stance you want for the truck. While our official recommendation is for 34” tires on the 1” and 35” tires on the 2”, we have had plenty of customers fit the 35s on aftermarket wheels with the 1” kit, it just may require some minor trimming to clear in all driving situations.